Teaching Without Walls: Life Beyond the Lecture: Back for more DOTS - Virtually! Back for more DOTS - Virtually! I had the pleasure to be invited back for my 4th presentation for the DePaul Online Teaching Series, more properly known as D.O.T.S. Sharon Guan, Director of Instructional Design and Development at DePaul University, invited to my first D.O.T.S. presentation back in 2007 after I was awarded my Sloan-C award. I've been back three more times since then, twice in person and yesterday presented virtually. My topic, again, was VoiceThread which seems to have become a favored topic of the Depaul faculty audience (and many others I've shared it with). 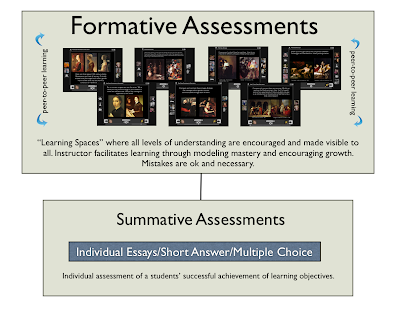 Of course, the formative assessments tie directly into preparing the students for successful performance on the summative assessments which are more comprehensive, individual evaluations of learning objectives. Please vote for MPB Reflections for Best ELearning Blog for the Edublog Awards 2009! Voting closes Dec 16th.